Steven (Chicagoland, United States) on 28 February 2012 in Landscape & Rural and Portfolio. Photo of Gillett Avenue after an overnight storm dumped 8" of snow. However, it was short-lived as the temperatures rose into the mid-40's the following day, melting just about all of the snow. A stark contrast from this shot in the Fall of 2009 and this shot in the Fall of 2007. Photo captured February 24, 2012.
beautiful composition and great winter scenery! That is gorgeous. Nice balance and Mother Nature created a nice subject for you. That's nice Steven, love these entangled snowy trees. They offer lovely shapes. A very beautiful photo . Superb in B&W ! Lovely, and what a chance from the picture of yesterday. Beautiful snowy archway and amazing vista! Looks great in black and white, just reading a report on the BBC website today claiming that the melting of the Arctic ice cap is resulting in longer and snowier winters for the Northern Hemisphere. Which is all very odd seeing as we have probably gone through the warmest snow free winter on record here. A great view and very well done photograph. Here today and gone tomorrow, eh? 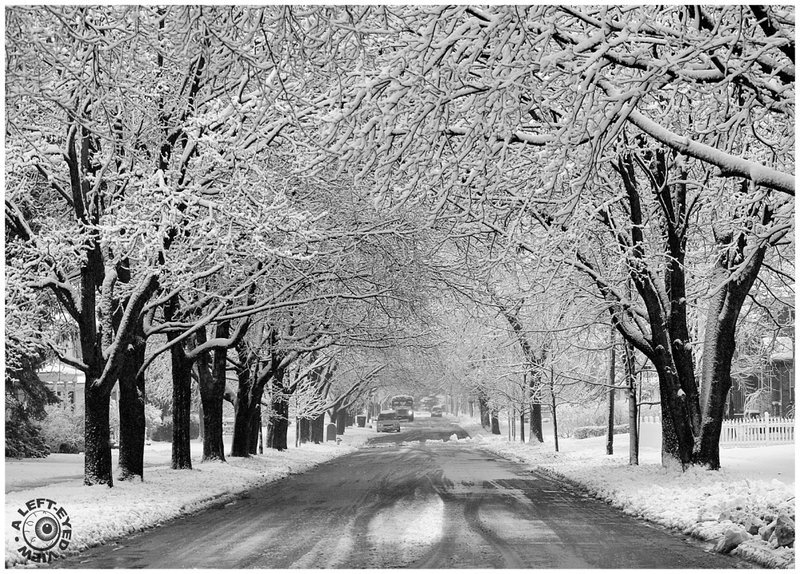 What a beautiful symphony of intertwined and snow-covered branches arching over the road. Lovely shot, Steven! It's beautiful while it lasts. Gorgeous B&W. The classic winter beauty shot. I love that fresh white coating. The street looks great through your framing. The autumnal shots are amazing too. like this view, with all these amazing details of the branches! great capture in a few colors! Loving this scene, short-lived though it was. That's why ya gotta get 'em when they show, right? ANd this street (or ones like it) when there is no snow always remind me of the closing scenes in Planes, Trains, & Automobiles when Neil Page and Del Griffith are walking own that street to neil's house after their LONG travails...Thai is probably my favorite all time movie and I watch it at least once a year, know every line practically...I STILL well up with tears at the end...SO thanks for bringing that street to my mind - Love this Mr S.
beautifull done, sir! The tree branches create the most pleasing archway for the road! Beautiful winter scene! Fantastic b&w! I love the trees! This is such a beautiful shot. I love looking into this natural tunnel. So great to photograph the same scene in different seasons. Beautiful trees. wonderful composition with superb contrast to bring out all the detail and textures! this photo has a good epth all the way through with every branch staying very sharp into the distance! Stunning winter scene. I like how these snowed tree branches make like a tunnel. Nice photo !!!! Very beautiful winter scenery with great tones and light.